Basketball proved to be the most popu1ar athletic activity aboard ship. At the height of its interest the inter-division 1eague attracted forty-four teams of enlisted men in addition to six teams in the officer’s league. A total of 500 players participated in the sport which furnished excellent recreation for the individual hoopsters and afforded many interesting hours of relaxation for the rest of the personnel who turned out in large numbers to root for their favorite teams. 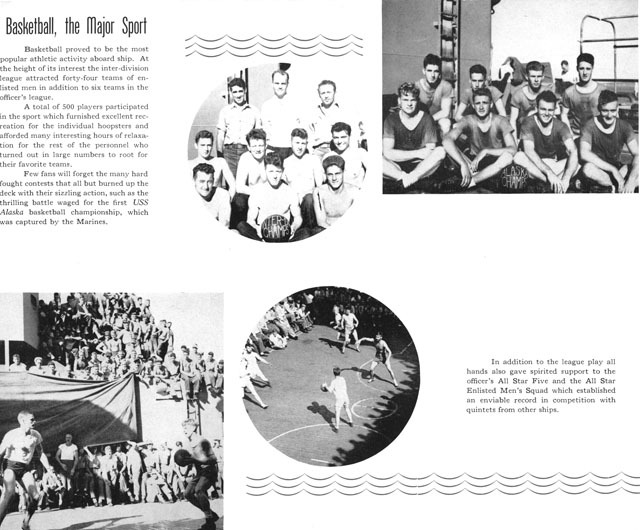 Few fans will forget the many hard fought contests that all but burned up the deck with their sizzling action, such as the thrilling battle waged for the first USS Alaska basketball championship, which was captured by the Marines. In addition to the league play all hands also gave spirited support to the officer’s All Star Five and the All Star Enlisted Men’s Squad which established an enviable record in competition with quintets from other ships. USS Alaska, was the first of the Alaska class large cruisers.